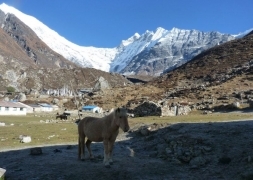 Langtang Valley Trek is a short and relatively easy trek in Langtang Valley with stunning panoramas of two major Himalayan Ranges, Langtang and Ganesh. After Everest and Annapurna Region Treks it is another popular trekking route, which is not over-crowded as Everest and Annapurna region. Once an important trading route with Tibet, this influence is reflected in the character of the villages and people. In Langtang Valley you can experience a wide variety of people, tibetan culture, plants, vegetation and animals. During parts of the trek you will be walking through a national park and even though wildlife is never easy to spot in a forest setting, maybe you can get a glimpse of some interesting animals and birds, like monkeys, musk deers, pikas and the national bird of Nepal, the colourful danphe. Langtang Valley Trek starts and passes through villages with terraced fields of paddy, corns, millet etc. (depending upon the season). Slowly it starts to go through the rhododendron jungles and then on to meadows and pastures with yaks, and at last to the alpine vegetation near Langtang. Not only the landscape around you changes as the trek goes higher, also a change in culture and religion is detectable. With coming higher the number of monasteries and Mane walls is increasing. In this relatively easy and short trek Tsergo Ri (a viewpoint at 5033 meters) is the main attraction of the trek. Tsergo Ri offers views of Langtang Lirung (7227 meters), Dorje Lhakpa (6966 meters), Yala Peak (5520 meters), Shishapangma and many other smaller peaks. Equally breathtaking views of Ganesh Himal Range can be enjoyed at the beginning of Langtang Valley Trek. Because of easy accessibility, this trek can be done any time in the year but March and April are the best months, because at this time the flowers bloom and you can have an amazing view of the Himalaya with the colourful rhododendron in the front. Day 01: Arrival in Kathmandu (1335 meters). Day 02: Sightseeing in Kathmandu, Pashupatinath, Swayambunath, Kathmandu Durbar Square, Boudhanath (1335 meters). Day 03: Drive to Syabru Besi (1460m). Day 04: Trek to Lama Hotel Village (2500m). Day 06: Trek to Kyanjin Gompa Village (3798m). Day 07: Exploration day in Kyanjin Gompa Village and optional climb of Tsergo Ri (5033m). Day 08: Trek back to Lama Hotel Village (2500m). Day 09: Trek to Thulo Syabru Village (2250m). Upon arrival at Tribhuvan International airport we will welcome you and transfers you to the hotel in Boudha. After time to get refreshed we will give you a detailed briefing on the trek, so that you are well prepared for the trip and any last-minute question will be answered. Today we will visit the most important sightseeing locations of Kathmandu. After breakfeast we will drive to Swayambunath, the "Monkey Temple" of Kathmandu, a buddhist pilgrimage with a small stupa. Then we will drive further to Pashupatinath. It is an important pilgrimage place for Hindus and a lot believers from India come there every week. There are lots of temples and at the shore of the holy Bagmati River, the believers burn there dead relatives. Then we will go back to the big stupa of Boudha, which is also known as little Tibet and enjoy your dinner at the rooftop of the hotel with view of the stupa. Today we will drive to Syabru Besi. We will drive about 7/8 hours and have some stops for taking photographs and lunch on the way. From Syabru you have magnificent views of Mt. Ganesh Himal, Manaslu, and Mt. Kerung of Tibet. After breakfeast we will start with the trekking which will lead us first about 2 hours through forest, followed by a 1 hour climb up to Bamboo Village where we will eat lunch. From this forested path we have the chance to watch colourful birds and other animals. The bee hives hanging on a cliff are another attraction for visitors. The last part of walking today we will again steeply climb to reach Lama Hotel. Today we walk about 5 hours through rhododendron and pine forest. A gradual climb continues throughout the day and slowly but steadily the trek enters the valley and ends at Langtang Village. After breakfeast we will leave the village and start our trek leisurely about 3 to 4 hours to visit Kyanjin Gompa at the end of the valley. From there you can see a spectacular scenery. You have fantastic views of Langtang Lirung (7246m) and Mt. Ganchempo (6387m). We will also visit a cheese factory and an old monastery there. In the evening we have time to relax in the lodge, sit together and talk or play cards. Today we will stay in Kyanjin Gompa village. We have time to explore the area and climb Tsergo Ri (5033m) from where we have stunning mountain panoramas. Tsergo Ri offers views of Langtang Lirung (7227m), Dorje Lhakpa (6966m), Yala Peak (5520 meters), Shishapangma and many other peaks. Today we will have an easy downhill and pleasant walk through rhododendron forest back to Lama Hotel Village where we will take rest before we continue our journey tomorrow to Thulo Syabru Village. Today we will again walk through rhododendron and bamboo forest where we may see the local, wild boar as well as other animals and birds. The trail will be very easy to walk at first, downhill, following the riverbank, but at last steep uphill for few hours until we reach Thulo Syabru Village. On the way we get amazing views of Mount Ganesh Himal, that seems to be very close to us. Day 10: Trek to Syabru Besi (1460m) and drive to Pokhara. Today is the last day of our trek. It will take only few hours to reach Syabru Besi and from there we will drive to Pokhara. It is a famous town located at Phewa Lake with a great view of the Himalaya. In the afternoon we can hike to the stupa from where we can get good views of the Himalaya or make a boatstrip on Phewa Lake. The lakeside is also a really good place to go out for eating and shopping. In the evening we will eat all together. Today we will drive about 7 hours back to Kathmandu. In the evening you will have free time. If you want you can do some more sightseeing or enjoy a visit in Thamel, where you can buy some souvenirs. Today we will be pick you up from your hotel and transfer you to the airport. I am sure you will remember this trip and take some great memories back to your home country! Hotel in Kathmandu: 3 nights: 3 star standard hotel with bed and breakfast. Hotel in Pokhara: 1 night: 3 star standard hotel with bed and breakfast. Langtang Valley Trek is a short and relatively easy trek in Langtang Valley with stunning panoramas of two major Himalayan Ranges, Langtang and Ganesh. After Everest and Annapurna Region Treks it is another popular trekking route, which is not over-crowded as Everest and Annapurna region. Once an important trading route with Tibet, this influence is reflected in the character of the villages and people and so you can experience a wide variety of people, tibetan culture, plants and animals. From Tsergo Ri you have fantastic views of Langtang Lirung (7227 meters), Dorje Lhakpa (6966 meters), Yala Peak (5520 meters), Shishapangma and many other smaller peaks.